Plastic injection is the most common process used for manufacturing plastic parts. The production tooling and injection molding are ensured by molding factories. Workshops or plastic injection molding factories possess different kind of machines, such as injection press for instance. Injection molding factories usually specialized in different activities and offer different materials and finishing. Those mold makers use different kind of machines and accessories to accomplish the production. These machines process thermoplastic materials, the most common been ABS, PC, PP and Nylon. A custom plastic injection molding enterprise provides High-Volume plastic parts. Our plastic injection molding factory has been established in China in 2006. In addition to the plant, we own two engineering offices based in China and in France. The team is made of 50 people, including manual workers, designers and plastic engineers. Our designers are able to analyze your 3D files and provide our opinion regarding your project, whether to modify it or not. How to find your plastic injection mold factory? There are common sense criteria to identify and select a mold maker to ensure the production of your project. Here, we may for instance list notions such as cost-effectiveness, quality and level of customer support. What’s more, plastic injection molding factories are usually focused on specific expertise, for instance pharmaceutical, automotive or household related equipment. Therefore, it is necessary to find a plastic injection molding factory which tools and materials enable the realization of your project. Besides this information, a visit in person is highly recommended to confirm the skills of mold maker. Level of reactiveness in answering inquiries and following projects. Level of technical knowledge and abilities during design and production phases. Equipment used for the production (machines and tools). Software equipment quality (Solidworks, Catia V5, Moldflow…). Abilities of the team, including engineering and languages skills. Past experience rich of numerous projects, various sectors and technical requirements. Efficiency of the test center. Level of precision and rendering of produced parts. Additionally, other ways to assess the strengths of a plastic injection mold factory are the existing clientele, list of treatments and applications (hinges, transparent parts…) available, number of accessories necessary for injection and mold quality. To finish, concerning logistic issues some mold makers also provide exportation services, meaning they do ship the mold to the client even when two countries are involved. On another hand, it may happen that some injection factories retain in-house the molds, providing only the injected parts. Production of plastic injection molded parts may be improved by geometries such as notch engineering. Two-shot molding or insert molding are engineering methods used to decrease price and lead times. They are especially useful regarding high volume production when requiring multiple resins for instance. Equipment: a mold is produced with CNC machines, such as CNC 4 axis milling and lathe, EDM and plastic injection molding machines (Injection press). Team: experienced molders include mold designers, plastic engineers and manual workers. Secondary operations such as shortened cycle times, assembly and consulting. 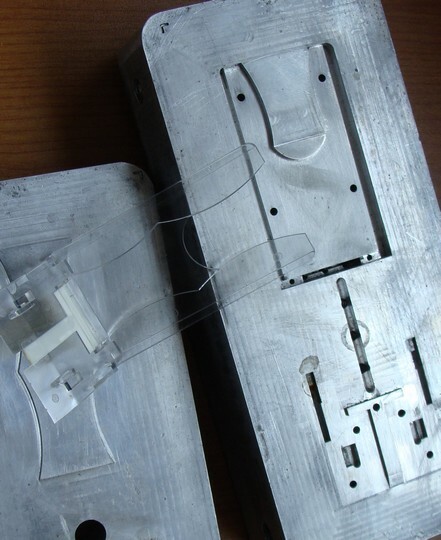 In short, plastic injection-molding is a technology to manufacture high-volume plastic parts. A plastic injection molding factory produce a mold from 3D files of plastic parts. In aluminium or steel, the mold is inserted in an injection press to start the industrialization process. To finish, an injection molding service company often provides rapid prototyping services to validate the drawings before to start the mold production. Hi, I’m looking for a company who can mold a snow play toy, maybe you can assist? Is a volume of 100 pcs to low to start production by injection molding? What technology should be used for your parts does regard to the mechanical properties of the part. We already did projects with 100 parts done by injection molding but most of the time we use vacuum casting. Please send us your 3D files of the part and we will come back to you soon with a solution and an offer.